Growing royally over the rocky and craggy land is one of Rajasthan's finest forts the Mehrangarh Fort. It looks down gently over the attractive city of Jodhpur. Famous for its wonderful forts and palaces, Jodhpur is the second largest city of Rajasthan and a main tourist attraction in the country. The city is located at the edge of the Thar Desert with Jaisalmer on its west, Barmar, Jalor and Pali on its south, Bikaner on its north, and Nagaur on the eastern side. 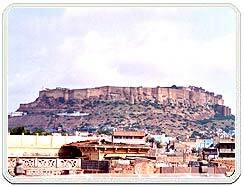 Jodhpur Rajasthan was founded by the Rajput chief Rao Jodha in 1459. 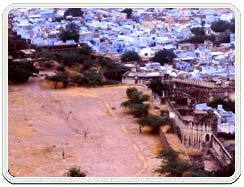 The city was the previous capital of the Marwar state. A courageous lookout in the desert, on the eastern edging of the Thar Desert has the difference of neither being a part of the Thar Desert nor out of it. At best it is an entrance to the wonderland of sand dunes and shrubs, rocky land and prickly trees. The home of the Rathroes the grand princely state of Rajasthan. They occupied Marwar, land of the sand after the fall of Delhi and Kannauj. In 1459 AD, Rao Jodha, chief of Rathore family of Rajputs, who claimed descent from Rama, the classic here of the Ramayana, laid the base of Jodhpur. A high stone wall protects the well fortified city. The wall is almost 10km in length and has eight gates opposite different directions. Within, stands an imposing fort on a low range of sandstone hills, about 125m above the surrounding plains. Invincible! And dauntless in its league with time! The city lies at the foot of the hills. The clear distinction between the old and the new city is visible from the ramparts of the fort. On the other side of the Jodhpur city, facing the fort is the Umaid Bhawan Palace. The irregular angle of the sunset lends the desert scenery a wonder inspiring glow and the people, a politeness undaunted. The old city of Jodhpur is fenced by 10 km long wall with eight Gates foremost out of it. The new city is outside the walled city. Rao Jodha, a chief of the Rathore family, founded the city Jodhpur in 1459 and it is named after him. In the turbulent political times of 1459 AD. Rao Jodha was adviced by a saint to establish an impregnable head-quarter and so, the Mehrangarh Fort was built on a steep hill. This formidable hill top fort is among the best in India with exquisitively latticed windows in residential apartments within. Carved panels and porches, elaborately adorned windows and walls of Moti Mahal, Phool Mahal, Sheesh Mahal, Sileh Khana, seem to make the medieval splendour come alive. A collection of musical instruments, palanquins, royal costumes, furniture and the cannons on the fort's ramparts are preserved. Mehrangarh Fort - Situated on a steep hill, Mehrangarh fort is one of the largest forts in India. The beauty and the grandeur of numerous palaces in the fort narrates a saga of hard sandstones yielding to the chisels of skilled Jodhpuri sculptures. Umaid Bhawan Palace - The only palace built in 20th century under the famine relief programme, has now been converted into a hotel with some parts being retained as a museum. Jaswant Thada - The 19th century royal cenotaph is built in white marble, in commemoration of Maharaja Jaswant Singh. Some rare portraits of the rulers of Jodhpur are also displayed here. Clock Tower & Sadar Market - In the old city, clock tower is a prominent land mark. But main attraction is the Sadar Market. The market has kept alive the old 'haat bazaar' culture. Ever wondered what luxury in the royal times was all about! Welcome to Palace On Wheels, a luxury train that carries with it an ambience of the Rajputana era and an exciting fairytale journey, which takes the visitor to the imperial cities of Rajasthan every single day. The coaches also carry out an image of the Rajput states with beautiful interiors. Last but not the least the "Royal Treat" for the passengers on board include saloons, bar lounges & libraries in every coach as well as restaurant and organized shopping facilites. Mandore : Towards the north of Jodhpur is the ancient capital of Marwar, Mandore. It is just 8 kms from the city. Main attractions of the place are Hall of Heroes with sixteen huge figures carved out of a single rock, the shrine of 330 million Gods and the royal cenotaphs. But one can not miss the caves in crags and the sprawling gardens, which are now shelter place for monkeys and peacocks. Greenery of the place makes Mandore, in true sense, an oasis. Ossian : 65-km from Jodhpur, lie ruins of an ancient city called Ossian. This city is famous for Brahmanical and Jain temples, which belong to 8th and 11th century. Surya or Sun temple and the Sachiya temples are famous for their beauty. The 'shikhar' of Sachiya temple is clustered by two rows of turrets, an ambulatory and a large assembly hall with an elaborate ceiling. Sardar Samand Lake and Palace : Rajasthani village life and vibrant cultural colours come alive as you drive along the 55 kms stretch. The monotony of the drive is broken by Chinkaras and Black Bucks who frisk pass the road. Air : Jodhpur has its own airport, which receives flights from major cities of India. Rail : Jodhpur is on the Western Railway's broad-gauge network and is linked to various centers in the region by express and passenger trains. Road : Jodhpur is well connected by luxury and deluxe coachers, overnight connections. Several coach operators run buses between Jodhpur and other major centers in the regions. In order to make the travel tour to Jodhpur even more joyful we offer just the right kind of accommodation for you and your family or friends in Jodhpur. Accommodations offered are exactly made for you. There are numerous luxury, heritage, deluxe and budget hotels in Jodhpur. Just select the one which best suites you.